This special issue is based on a workshop which began with a description and examination of the current National Assessment of Educational Progress (NAEP) standard-setting model, then looked to standard-setting applications outside of education. These applications included those that focus on human performance and the adequacy of human performance; in these contexts, raters were asked to focus on the knowledge and skills that underlie competent performance. Researchers also examined applications that focus on the impact of environmental agents on life and the ecology; in these cases, raters began with the knowledge that more (or less) of a substance is better and, as for NAEP, the judgment task was to determine "how good is good enough." They wished to examine parallels in the objectives, empirical grounding, judgmental requirements, and policy tensions for standard setting in NAEP and in other domains. These papers were commissioned to examine the current state of affairs and residual issues with respect to achievement-level setting in NAEP and to help determine whether the models and methods used in other disciplines have useful application to education. It is important to note that the papers represent the authors' views, not necessarily those of the committee or National Research Council. 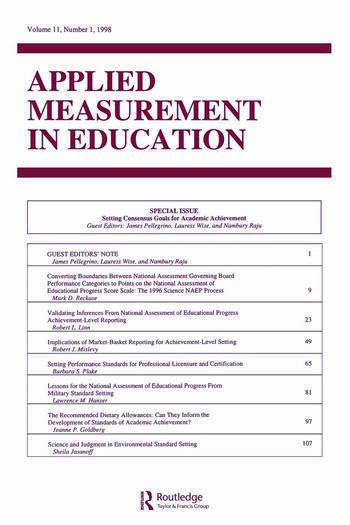 This issue and the workshop discussion point out a number of analogies between the objectives, requisite data, judgment requirements and policy issues for NAEP and other applications. The editors hope that this issue and wide distribution of these papers will prompt others to join in this interesting analysis and debate. Contents: J. Pellegrino, L. Wise, N. Raju, Guest Editors' Introduction. M.D. Reckase, Converting Boundaries Between National Assessment Governing Board Performance Categories to Points on the NAEP Score Scale: The 1996 Science NAEP Process. R.L. Linn, Validating Inferences From NAEP Achievement Level Reporting. R.J. Mislevy, Implications of Market Basket Reporting for Achievement Level Setting. B.S. Plake, Setting Performance Standards for Professional Licensure and Certification. L.M. Hanser, Lessons for the NAEP From Military Standard Setting. J.P. Goldberg, The Recommended Dietary Allowances: Can They Inform the Development of Standards of Academic Achievement. S. Jasanoff, Science and Judgement in Environmental Standard Setting.